What is the Message of the "Patio Tomb" in Talpiot, Jerusalem? The article provides a useful summary of the issues raised by the documentary and the related book (but not the Jesus Discovery website or the Preliminary Report, neither of which is mentioned). Charlesworth is broadly supportive of Tabor's and Jacobovici's claims, but he is cautious and sceptical at several points. Charlesworth discusses the different possibilities for the interpretation of the image on ossuary 6 (nefesh, amphora or fish?) and he defends his reading of YONAH at the bottom of that image. He asks lots of questions and encourages continued debate. The piece is aimed at a non-scholarly audience for whom Charlesworth explains terms like "ossuary" and "nefesh"; he explains what happened in 66CE (pp. 1-2); he notes the correspondences between Hebrew and English letters (pp. 6-7) and explains that "Hebrew is written right to left" (p. 7). In spite of that target audience, I will admit to some disappointment that Charlesworth does not engage directly with any of the scholars' critiques of the project, whether here, on the ASOR blog, on Bible and Interpretation, on Robert Cargill's blog, on Christopher Rollston's blog or elsewhere. He does mention "scholars and non-scholars" who "have been reporting and blogging" and he speaks about his dismay over "occasional ad hominem comments". As one who has experienced some unpleasant remarks, including from those involved in the making of the documentary, I very much share Charlesworth's concern on that front. Nevertheless, I think there is a danger in only mentioning blogging in the context of complaining about those who abuse the medium because it can all too easily be taken as a reason not to engage with serious scholarly criticism of the claims. In relation to this, it is disappointing that Charlesworth simply repeats the sight reading of the inscription on Ossuary 5, "Divine [YHWH], who lifts up (or raised up), from (the tomb or death?)" (p. 5), which is seen in the documentary, and does not engage with the careful analysis and criticism of this claim, with alternative readings, offered by Richard Bauckham, Christopher Rollston and others (see also Rollston's review here; see further links in those posts). The difficulty with not engaging with the critics is that it can give the impression that the reading in question is uncontested and somehow self-evident. It is not. It is controversial and unclear. By contrast, there is some exposition of the alleged YONAH inscription that appears at the bottom of the image on Ossuary 6 (pp. 5-8). It is useful to have this exposition given that previously Charlesworth's views were only known through reports (See most fully Taborblog). Charlesworth is actually quite guarded about his suggestion and only puts forward the reading quite tentatively. Of the four alleged letters, he regards only the he as "unmistakable" (p. 6). The yod may be a zayin; "some imagination is required" for the reading of the waw (p. 7) and the nun "is not prima facie obvious" -- it may be a lamed (p. 6). Having read Charlesworth's own defence of this claim, I admit to being no more convinced than I was before, and pleased to see the way in which he makes the suggestion only tentatively. One of the reasons for my own scepticism has been the confusing nature of the case. With so much going on in the head of the fish / base of the vessel -- arms and legs of a stick man, a mouth and an eye of a fish, Hebrew letters that extend unusually and further lines that are unaccounted for -- it is doubtful that YONAH is there (see further The Texas Sharpshooter Fallacy and the Talpiot Tomb). Like Tabor and Jacobovici, Charlesworth is inclined to see a stick man here too (p. 8), though he does not explain which lines belong to the stick man, and whether any of the lines that form the stick man do double duty as parts of the alleged YONAH inscription (see further my Changing Body of the Stick Man and links there). I suspect that most scholars will remain sceptical about the presence of a stick man given the lack of clarity about which lines represent his arms and legs. If this is a large fish and Jonah is intended, then it is possible to image [sic] a stick figure inside the fish. If so, the head is absurdly large. Why? Obviously, some Jews imagined the resurrection body to be similar to but different from the fleshy body. Would some early Jews have imagined a resurrected body would have a large head? Is that the ideal body? We simply need to raise questions and be open to dialogue. (p. 4). I would be interested to hear if there is any analogy for the idea of the resurrection body having a massive head. I would doubt it, but I will listen with interest. But in any case, the key question presumably would relate not to the resurrection body but to the book of Jonah, where there is no hint that the character has a massive head, either before or after being swallowed by the fish. Why has the engraver spent so much time on the lines within the spherical "bottom"? One can count at least 14 strokes. Why? What was imagined? (p. 4). A symbol must be interpreted and usually has many meanings. Symbols appear in a world of ambiguity and bring with them more than one meaning (p. 3). But, something is intended. We should move beyond what it could possibly be and ask what is the intentionality that created this image (p. 4). -- I can't help thinking that it is unnecessary to interpret the image as a conflated nefesh-fish when the vessel interpretation appears more plausible. The image has something on each side. Could these be handles? 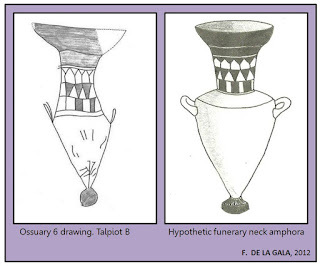 If so, they are not like any known handles on an amphora, whether drawn or part of an amphora itself (p. 4). The key point about this image, which Tabor and Jacobovici concede may have been interpreted as a vase in 1981, is that it provides the all-important contextual information about the image on the façade. Vase on the side; vase on the front. Jonah was read on the evening of Yom Kippur (the Day of Atonement) to signal the importance of seeking forgiveness before God. There is, however, no evidence that I am aware of that Jews were reading Jonah on the Day of Atonement as early as the first century. The first reference I know of to Jonah being read at Yom Kippur is b.Meg. 31a. But in any case that does not help with the imagined Christian identification of the tomb. These Jewish reflections [Matthew's] are from the first century CE, but after 70CE they were reported by those who were claimed to have seen a resurrected Jesus (p. 9). And Charlesworth goes on to quote 1 Cor. 15.3-8 followed by Joseph Ratzinger's Jesus of Nazareth. It looks like Charlesworth is here distancing himself from interpreting the sign of Jonah as a sign of the resurrection in the pre-70 period, and so aligning himself more with sceptics like me than with Tabor and Jacobovici. But I could be wrong -- it is not easy to parse Charlesworth's prose here (What does "there were reported by those who were claimed to have seen a resurrected Jesus" mean?). Before concluding this post, there were three further elements that raised questions. 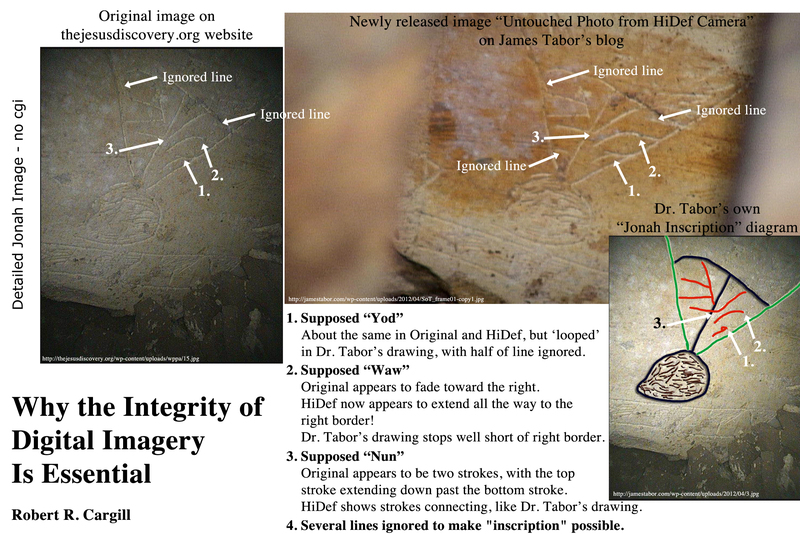 The first is a mention of a "rubbing of that image" (p. 11, n. 2), i.e. 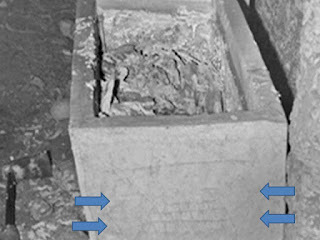 the image of the fish / vessel on ossuary 6. I had not heard about this before and so asked Prof. Charlesworth for clarification. He responded by saying emphatically that in fact "there was no rubbing" but it remains unclear what he is referring to in that note. Second, I was interested to see measurements for the fish/vessel image (23 x 15 x 9 x 3) for the first time. This is helpful information, but I am curious about how the image was measured. Third, I don't understand the dates given in the article. On p. 1, the first sighting is in the "summer of 2011" but on p. 2, the same event seems to be dated to "January 2012". In summary, after having read Charlesworth's article carefully, I am sorry to say that I remain completely unpersuaded by the claims made in the documentary, the book, the website, and the preliminary report. (1) I have been able to access Jim Charlesworth's article only via your website. I cannot find it on the Foundation on Judaism and Christian Origins website, and I am baffled by the opening sentence of the article: "For the full report with more images, visit http://www.FJCO-DSS-Events.org." I cannot find this "full report" at that web address. Where should I be looking? (2) Charlesworth's reiteration of the reading of the Greek inscription that he made when he first saw it (shown in the film) without taking any notice at all of any of the very considerable subsequent discussion of it by fellow-scholars is extremely disappointing, especially as he himself says in this article that "we need each other in a dialogue that appreciates the input of others" (p. 5). 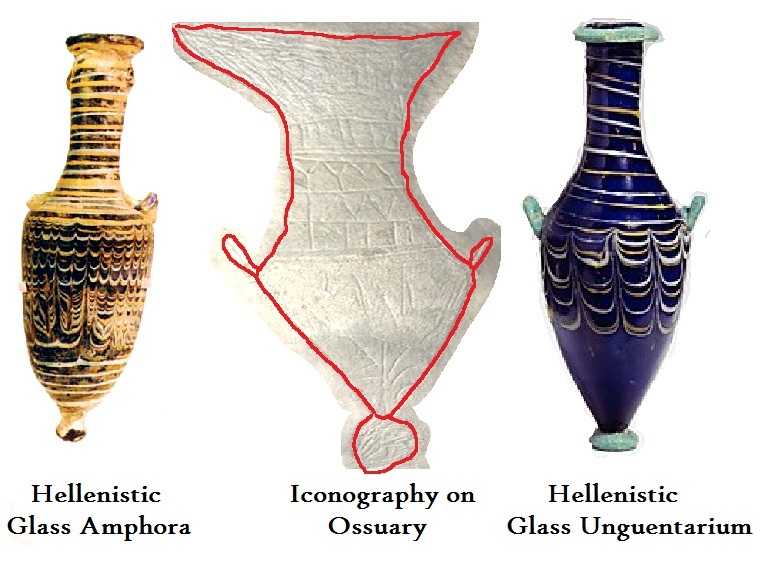 (3) I was puzzled by his appeal to the multivalency of symbols in relation to the fish/nephesh/amphora image when he first made it in email correspondence back in the autumn, and his elaboration of it in this article still leaves me baffled. He says, "Any attempt to enter the mind of an engraver in order to discern the intention of an “artist” borders on unsophisticated methodology," but then goes on precisely to discuss all sorts of considerations precisely with a view to discerning the engraver's intention. Furthermore, what exactly does he mean by calling this image a symbol. His footnote refers to his own extensive discussion of the image of the "serpent" in his book on that topic, reporting that he found this to have about thirty meanings. But these are all meanings of the image of a SERPENT. This scarcely seems a valid parallel to the suggestion that the image on the ossuary may be ambiguously a nephesh or an amphora or a fish. If it is indeed a fish, then one might say that the fish is a multivalent symbol - conceivably, for example, an early Christian engraver might have intended both Jonah's fish and the Christian ICHTHYS acronym (though Jim Charlesworth himself rather dogmatically dismisses the latter as having any relevance). An amphora might also have more than one possible symbolic significance (a funerary symbol? one of the famous Temple vessels?). In such cases, we could be dealing with an intentionality on the part of the engraver to provide a symbol with a range of meaning or we could have an image so ambiguous that we can't discern the engraver's intentionality, given our limited evidence. But what does it mean to say that the image is ambiguously a nephesh and a fish and an amphora? I don't think Charlesworth means that the engraver could have intended such an ambiguity (see page 4, paragraph 4, beginning "It is easy..."). He seems to mean that the image is ambiguous to us and we find it very difficult to discern the engraver's intentionality. Even so, as I have pointed out, Charlesworth himself offers plenty of considerations towards resolving the ambiguity. So is his appeal to the multivalency of symbols no more than a warning to us not to seize too quickly on an interpretation, but to engage, as he says, in "a dialogue that appreciates the input of others, whether philologists, archaeologists, biblical scholars, or specialists in ancient art" (p 5). If that is all it amounts to, then I must say it seems to me that a good deal of such dialogue has actually occurred in the extensive discussions, especially in the highly reputable location of the ASOR Blog. I can say this as someone who has not contributed to that particular dialogue myself (reserving my own contributions to the discussion of the Greek inscription). Update 2 (Friday, 10.05 am): See now James Tabor's comments on Charlesworth's article at Taborblog. Tabor echoes Charlesworth's focus on the "intention" of the engraver and suggests that "Often only a trained eye can decipher what the writer intended". This may well, of course, be the case, but the "intention" of the writer still has to be demonstrated on the basis of what s/he actually wrote. Also, as Charlesworth points out, those who read these markings as intentional Hebrew letters do not claim that all the marks in the mouth of the fish are part of the letters, some are related to the fish itself (i.e., the straight line of the mouth), whereas others seem to form the eye of the fish as well as the arms and legs of a stick-like figure, attached to the large head. What does seem to be the case is that all of the inscribed markings (not the scratches or imperfections in the stone) are intentional. There are, I think, a couple of difficulties here. First, Charlesworth does not appear to be convinced that the image is a fish. He thinks it might be, but he also finds the nefesh and amphora theories compelling, even suggesting some conflation of all three, with ambiguity and multivalence. 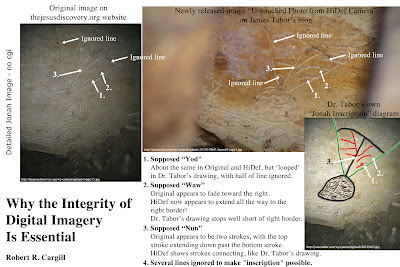 But if it is not a fish, then all the extra lines in its "head" need explanation because they can no longer be relegated to the background in order for the alleged YONAH inscription to stand out. Notice especially the several "ignored lines". Obviously, I never intimated that all the lines in "the head of the fish" are letters; anyone who imagined that I did make such a claim or that I ignored some lines simply was dependent on a journalist's summary of my comments (p. 7). And Tabor here echoes the comments. I am puzzled by their insistence on this point since I am unaware of anyone who says that they claimed that "all the lines . . . are letters". It is a fact, though, that several of the lines in the "head of the fish" do not do service as letters or lines in the fish head or lines on a stick man. But to repeat my earlier point, I think it is always preferable to cite those against who one is arguing so that one can check up on whether the argument is fairly represented. Update 3 (30 May): the link to Charlesworth's article is now broken and has been since at least 26 May. The report is that Charlesworth's article was a draft and that it was uploaded by mistake. More here. Update 4 (11 June): a revised version of the article is now available on The Bible and Interpretation. Although some of the revisions adjust points that I had criticized above, most of my critique stands. I will therefore revise and repost this response and provide a link here when it is ready. Update 5 (11 June): my revised version of this post now updated in line with the revised version of Charlesworth's article is available here. I'm working on a critique of my own. And I DO find the attempt at a harmonization of the multiple interpretations - a fish-shaped amphora, perhaps used as a nephesh - a bit apologetic. But I think it would be better if it were more prominent on the site. Thank you for following and commenting on the ever-continuing Talpiot Saga. As a follower of the Saga, both here and on other blogs/sites, there were several statements by Dr. Charlesworth that mystified me. Foremost among them was his open appeal to scholars (and others) to participate in the debate regarding the images from the tomb, while at the same time revealing he is completely unaware of the current debate about the images! Dr. Charlesworth's earlier sentence perhaps gives us some explanation. Charlesworth writes that he was dismayed over "occasional ad hominem comments" directed (I can only presume) at the Talpiot "team" which he read online. To me, this seems to be another reference to the "straw man" that Dr. Tabor has referred to time and again, the "personal attacks" that he claims scholars have directed at himself and Jacobovici. As others have noted, this is simply untrue. As your readers remember, members of the Talpiot production staff logged onto your blog and Dr. Cargill's blog and openly directed "ad hominem comments" at all vocal critics of the conclusions present in the documentary and book, even going so far as to claim that these critics were "Christians" and this was the real reason behind their criticism. Surely this is not what Dr. Charlesworth means with his comments, but it is nonetheless distressing to see both his ignorance of the ongoing debate and his offhanded dismissal of the excellent scholarly work being done on these blogs. Perhaps the only way to deal with this attitude, once and for all, would be for the authorship of a paper that summarized all the useful rebuttals of the various Talpiot theories. This paper could then be published in a respected journal and one could refer to it from time to time, when necessary (and I am certain it would be necessary). In closing, regarding Latin phrases, as I read through Dr. Charlesworth's article, I ran across several instances where the phrase "ad hoc" came to mind. Thanks for your analysis, Mark. I also remain completely unpersuaded by the claims a few made about the image they call Jonah and the fish and about the inscription a few claim reveals belief of early followers of Jesus about resurrection. The big fish is an inverted depiction of an Ethiopian mesob. The "fins" on the sides are carrying straps (usually made of leather even on modern-day mesobs). The fact is that it's far more profitable to sell this find as something you can make documentaries about and replicas of to stick into museums the world around.